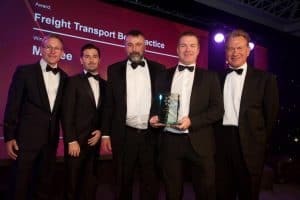 FORS, the Fleet Operator Recognition Scheme, is to sponsor the Freight Transport Best Practice award category at the Chartered Institute of Logistics & Transport (CILT) Annual Awards for Excellence on 18 October. It will be the fourth year in succession that FORS has supported this important annual event, staged again this year at the Royal Lancaster Hotel in London. The CILT Annual Awards for Excellence ‘recognises the achievements of individuals and business to promote the highest professional standards in logistics and transport’. The 2018 CILT Annual Awards for Excellence is again expected to attract leading transport professionals from across industry. Category nominations will be open from 19th February.